This week, the world's largest passenger jets, the Boeing 747 and Airbus A380 each made the kind of news that manufacturers don't like to make. Both Airbus and Boeing signaled their biggest jets might be nearing the end of their production lives, as orders for their large twin-engined planes cannibalize orders for the largest planes made. "We're making this minor adjustment because the near-term recovery in the cargo market has not been as robust as expected. We continue to believe in the long-term strength of the freighter market, and the 747-8 is uniquely positioned to capture this demand." Last year, Boeing reduced 747 production from 24 planes a year to 21, and then once more to 18. In production since 1969, over 1,500 747s have been built within the walls of the world's largest building (by volume) in Everett, Washington. Aviation enthusiasts and airlines have referred to the 747 as the Jumbo Jet, or Queen of the Skies. Poor sales have been pegged by Boeing to a decline in international air freight, saying nothing of the lack of demand for the plane from airlines. The 747-8 freighter version was the first to roll off the assembly line, in 2011. 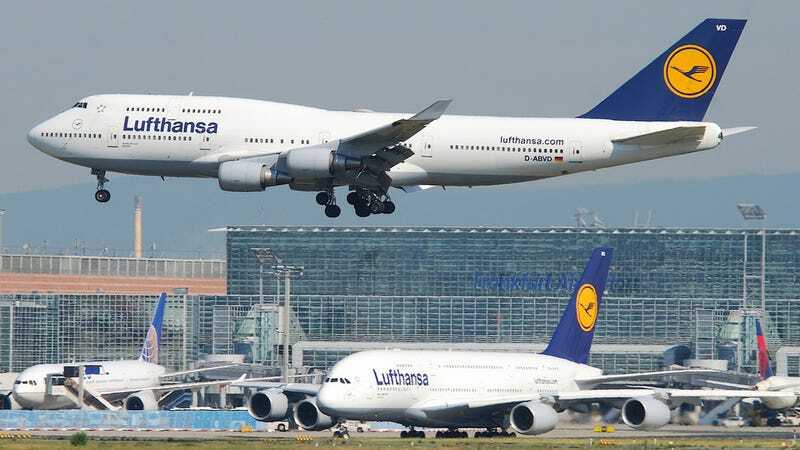 Then in 2012, Lufthansa took delivery of the 747-8i passenger version, and was the only airline operating the plane until Air China received its first 747-8i in September. As of this month, there are only 39 747s remaining on Boeing's order books. On the heels of this latest production reduction, the Puget Sound Business Journal reports that the Air Force is rumored to be considering moving up its timeline to replace their aging VC-25s — specially modified 747-200s used as Air Force One. The current VC-25s have been in service since the administration of George Bush in 1990, and the larger, more fuel efficient 747-8i is the most obvious replacement. Last year, the Air Force had said it wasn't looking to replace the planes until 2021, but Boeing's current backlog only keeps the plane in production for three more years. If the Air Force decided to delay their decision or go with a different jet, Boeing's twin-engined 777-9X is projected to be much more efficient than the 747, and not significantly smaller. Across the pond in Toulouse, France, Airbus has also received zero orders this year for its biggest plane, the A380. On Wednesday, Airbus CFO Harald Wilhelm told investors that production of the A380 could also end as soon as 2018, unless they could make improvements to the plane and keep it competitive in terms of operational cost. He said that while production slots are full for the next three years, that rate does not continue into 2018. The A380 has only been in service since 2006, and Airbus sales chief John Leahy dismissed Wilhelm's remarks by saying "The A380 will dominate the market in years to come." That's some nice sales-speak there, but there's a huge gray area that's not addressed. For one, what market? When the A380 and 747-8 aren't selling, the market has dried up. What happens in three years when that backlog disappears? We may have an answer, or at the very least some posturing from Airbus. On Thursday, Airbus CEO Francois Bregier said the company has plans to build an A380neo, as well as a stretched version of the A380, which is already the world's largest passenger plane. Dubai-based Emirates has 55 A380s in service, plus orders for 85 more, and has been pushing Airbus to offer more efficient engines for the WhaleJet. Emirates CEO Tim Clark says that Airlines need the A380 because passenger traffic is expected to double in the next 10 years. Clark said, "If airlines don't believe they can fill an A380 then their business model is wrong. If they can't fill it there is something wrong with their marketing." Clark said Emirates would buy 140 A380neos if Airbus decides to build them. An A380-900 would hold 650 passengers in a standard multi-class configuration, while an all economy version could hold over 900 passengers. Nine. Hundred. While Airbus seems hopeful for the future by proposing improvements, Boeing seems to be writing the eulogy for the 747. But a hypothetical airplane is simply that. Airbus spent $25 billion developing the A380, and has only delivered 168 of the planes. Even if the 747 line shuts down first, the A380 has a lot of ground to cover before matching the success of the 747.